Net Asset Value (NAV) is the total value of assets net of the gross debt of the Holdings System as defined below. 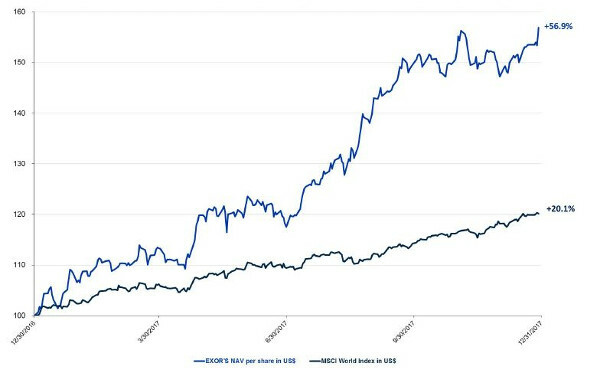 In determining the total value of assets at 31 December 2017, listed equity investments and other securities are valued at trading prices, unlisted equity investments are valued at fair value, determined annually by independent experts, and unlisted other investments (funds and similar instruments) are valued by reference to the most recent available fair value. Bonds held to maturity are valued at amortized cost. Treasury stock is valued at the official stock exchange price, except for the part designated to service stock option plans (measured at the option exercise price under the plan if this is less than the stock exchange price) and that assigned to the beneficiaries of the stock grant plans which is deducted from the total number of treasury shares held. The sum of the aforesaid values constitutes the total value of assets (Gross Asset Value). Gross debt is the total amount of the financial debt of the Holdings System. The elements included in the Gross Asset Value and in the gross debt denominated in U.S. dollar and Pound sterling are converted into Euro at the official exchange rates at the date of the period indicated in this presentation. At 31 December 2017 EXOR’s NAV is $22,972 million (€19,155 million), an increase of $8,330 million (+56.9%) compared to $14,642 million (€13,890 million) at 31 December 2016). NAV per share amounts to $95.32 equal to €79.48 at 31 December 2017 ($60.75, equal to €57.63 at 31 December 2016). The decrease in financial investments is due to the redemption of The Black Ant Value Fund. 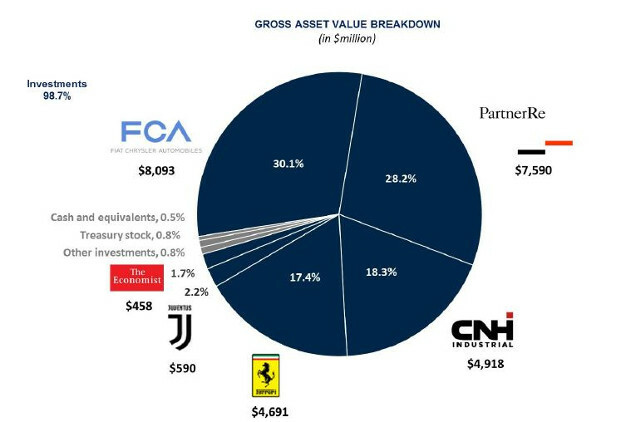 The following pie chart shows the composition of Gross Asset Value at 31 December 2017 ($26,893 million). “Other investments” include the investments in Welltec, Banca Leonardo and GEDI in addition to minor sundry investments.